Some time ago I discovered „The Mitt“ by Ivan Franko. I liked the idea of a flexible software synthesizer combined with a precise hardware controlled parameter modulation. The idea is to create different concepts of modulation or forms of synthesis in general. The prynth framework itself is based on the legendary „supercollider“ and is served via a webapp running on a rapsberry pi. That way it is very easy to modify with a few clicks. 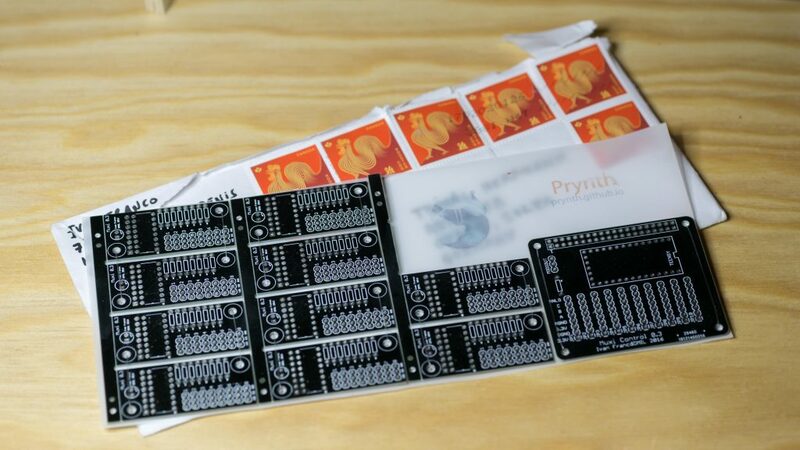 I took part in a competition by Ivan in which he gave away a set of prynth pcbs that are used to feed the hardware signals into the raspi. Looks like I´ve won, together with 2 other participiants and for the first time I received a letter from canada! The main pcb has a teensy on it reading the voltage on the voltage dividers made up by the potentiometers. Up to ten variable resistors are supported by the muxi control mainboard. For bigger projects featuring more control inputs the smaller mux pcbs add a maximum of 80 (!) inputs. Currently the „hack and make Jena“ group is working on creating a mostly practical synth with some additional features to modulate it fluent and intuitive.